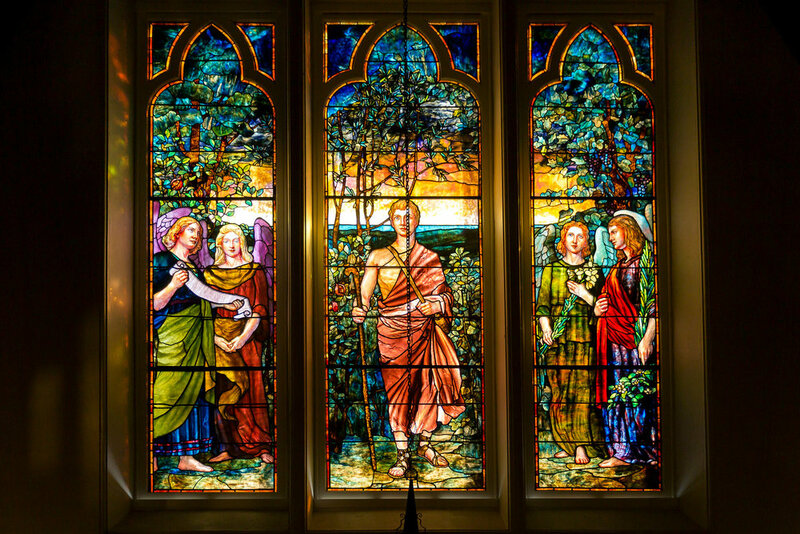 The stained glass of St. Mary's is an impressive collection of work by major American Art Glass Studios, including Louis Comfort Tiffany, John La Farge, and Lamb Studios. A variety of art glass making techniques are exemplified in the works, including fine portrait painting on glass. The collection reflects the height of the craft of stained glass and leaded glass in America. 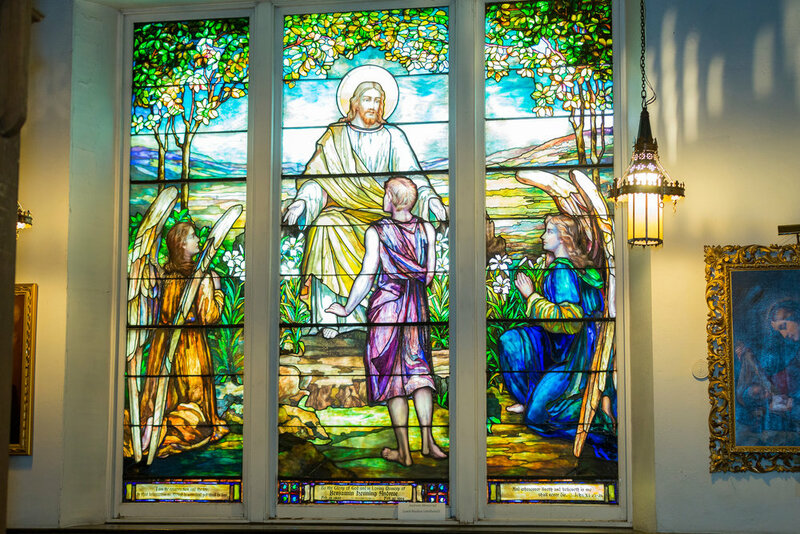 We invite you to tour this gallery of our windows online or in person (the first windows below can be found in the vestibule, and then on your right in counter-clockwise order as you enter the church). 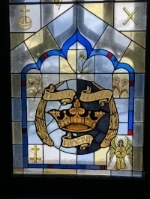 On May 7, 1989 in celebration of the one hundredth anniversary of St. Mary's-in-Tuxedo, these windows were dedicated to the glory of God and in loving memory of Gabriel and Francine Demay by their son George. In memory of Frank Brigham (1900-1973). All things bright and beautiful, all Creatures great and small. All things wise and wonderful, the Lord God made them all. The first window on your right as you enter the church. 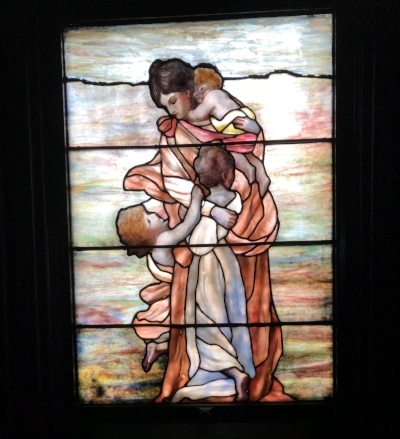 by Louis Comfort Tiffany, in memory of Emily Post Griswold, May 10, 1905. I have fought a good fight, henceforth there is laid up for me a crown which the righteous judge shall give me. 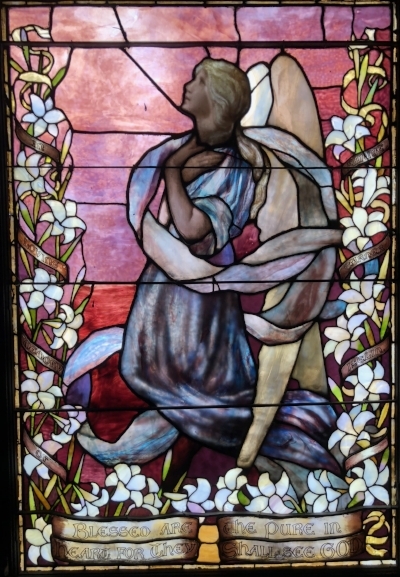 The Apse Window, by John La Farge, in memory of Nathaniel Griswold Lorillard (1864-1888). Let Patience have her perfect work in thee. 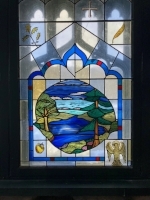 St. Mark's Chapel Window by G. Guthrie, in memory of Bruce Price Post (1895-1927), renowned architect, grandson of Bruce Price and youngest son of Emily Post. by Lamb Studios, in memory of Fannie Garner Iselin (1861-1890). Blessed are the pure in heart for they shall see God. by Louis Comfort Tiffany, presented by ELB, Xmas 1890. They also serve who only stand and wait. 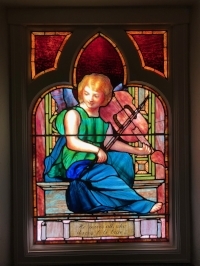 St. Mary's-in-Tuxedo has established a fund specifically for the preservation of our historic buildings and especially our beautiful stained glass. Regardless of whether you are a member of the Church, a resident of the community or someone who believes in preserving the best things given to us by our ancestors, we hope you will consider making a donation to our historic preservation fund. Help ensure this touchstone of our community will continue to serve as a place of worship, a landmark of our architectural and cultural history, and as a place for anyone to reflect on the beauty of craftsmanship and artistry. Please contact us for more information or donate using the link below. Please like us on Facebook to get regular updates and see photos of events.